If you have a wood deck, you know that there is maintenance involved to keep it looking nice. 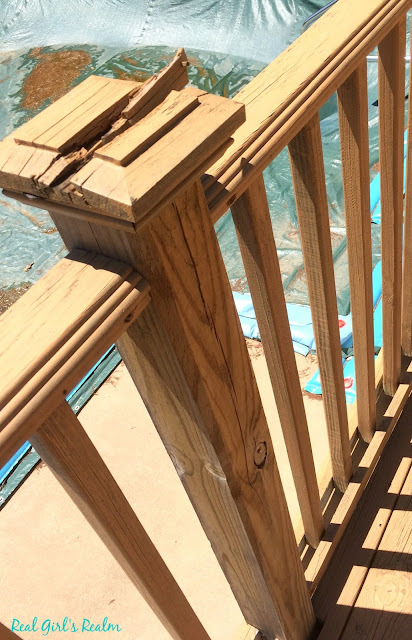 We re-configured our deck and replaced all the railings a few years ago and it has been about 3 years since we stained it, so it was looking a little rough. I brought my deck back to life in a weekend by following these steps. Clean off the deck - Remove any furniture and potted plants from the deck and sweep up any large debris. Power wash the deck - You will need to rid the wood of debris and mildew that has built up over the winter. We purchased an inexpensive electric pressure washer from Harbor Freight Tools, so we did not have to borrow my dad's gas powered one that is bulky and hard to use at times. Make sure you read all the directions and wear safety gear while using the pressure washer. I always wear my old rubber rain boots, a mask to keep out the pollen and debris, gloves, and safety goggles. 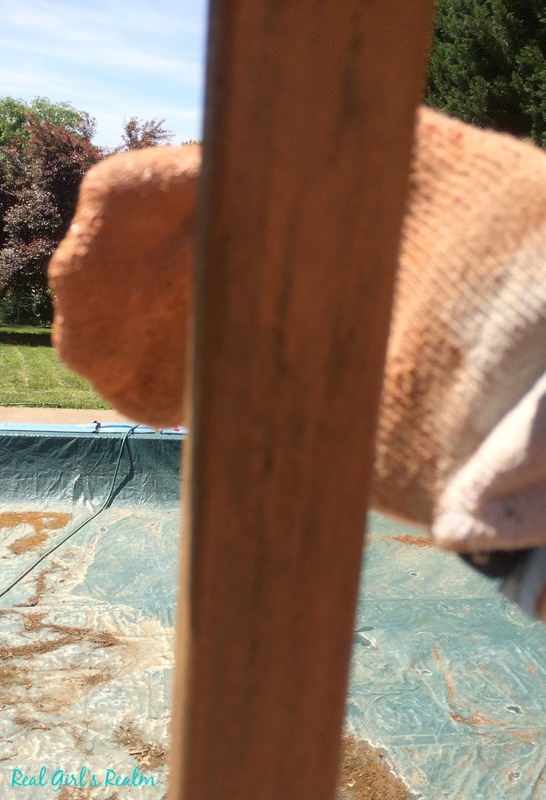 Use a medium pressure, especially if your deck boards are older like ours. I also use the fan spray setting so it does not tear up the wood. Keep the wand moving because if you stay in one place, the water spray will gouge the wood. Fix any loose boards - We had a couple of loose boards that were sagging and cracked so we replaced those. There were also several post caps that were falling apart, so I replaced them too. Allow the deck to dry for 48 hours - I pressure washed the deck on Saturday and applied the stain on Monday so the deck had time to dry out. I also swept the deck again, prior to staining to remove some of the old stain that had flaked off with the power washing. 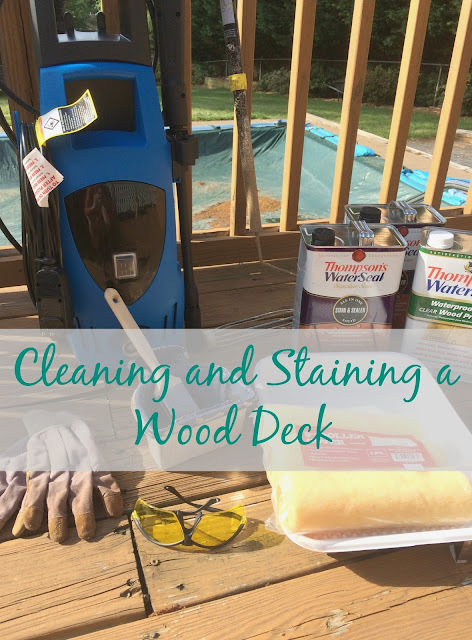 For best results, the deck should be clean and dry. 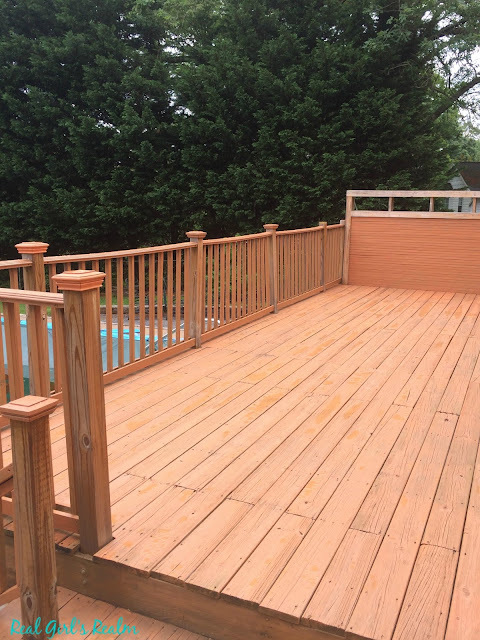 Apply the stain - We have a two-tone deck with the bulk of the deck being stained and the posts and trim remaining natural. I selected Thompson's WaterSeal Waterproofer plus Clear Wood Protector and Signature Series Stain & Sealer in Natural Cedar Solid which is sold exclusively at Lowe's. 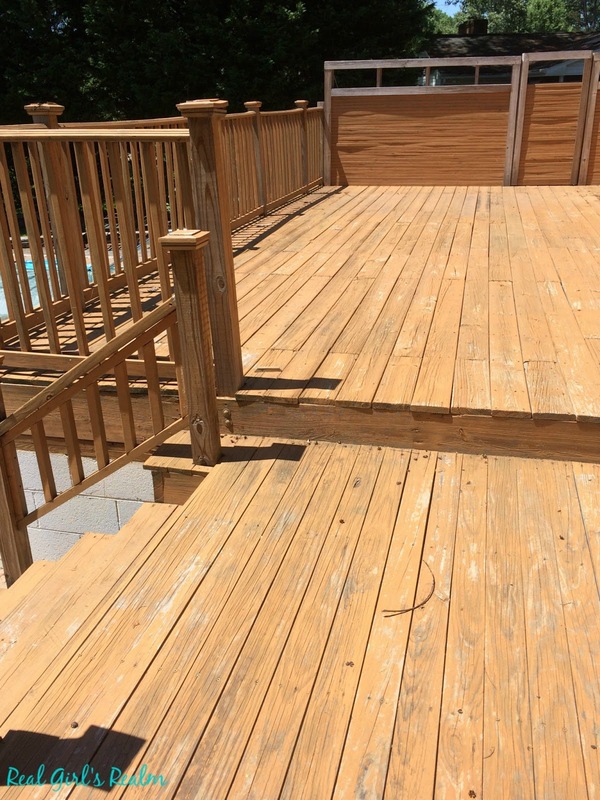 Since our deck is a mixture of old and new wood, we chose the solid stain to achieve the most uniform look. If you prefer the wood grain to show through, Thompson's has transparent and semi-transparent options as well. Make sure you read all instructions before beginning the process and follow the stated direction for optimal results. Step 1 - Start with the stair handrails and the railings. I used a paintbrush and a hand-held paint cup. Step 2 - Paint the vertical rail pickets. This is where the sock comes in...put on a disposable glove and find a mate-less sock (you know you have at least one!) and put it on your hand. Dip your "sock hand" in the stain and apply the stain to the pickets from the top down. This sounds crazy, but it goes so much quicker than using a paint brush! Step 3 - Paint any other vertical surfaces. 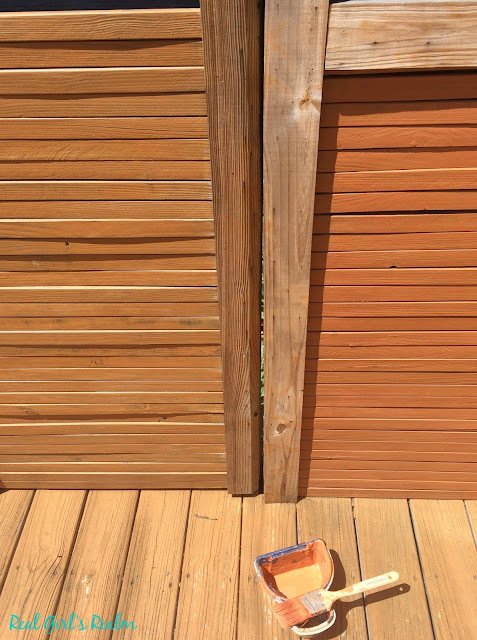 We have a privacy wall at one end of our deck, so I painted it using a combination of the roller and paint brush. Step 4 - Paint the floor in small areas, moving from the inside to the outside, so you do not "paint yourself into a corner," since you cannot walk on it for a few hours. I went through four rollers because our deck boards are old and uneven, so the roller nap flattened quickly. Because our boards are uneven, I also had to paint the boards in both directions (with the grain and side to side) to get full coverage in all the nooks and crannies. Step 5 - After the stain was dry (and it stopped raining), I went back and painted the posts and trim with the Clear Wood Protector. 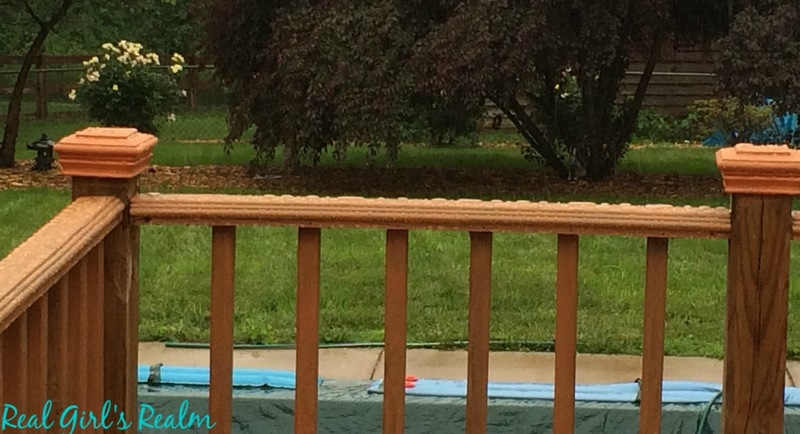 Step 6 - Let dry for 24 hours, then you can replace your deck furniture and decorate! 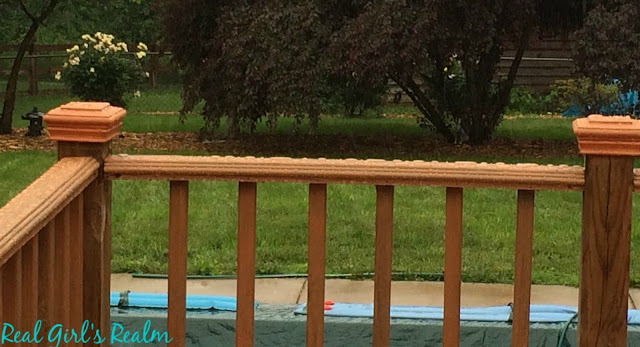 It took me about 6 hours to stain our deck by myself and I finished just in time because we had a huge downpour the following morning. But you can see the water is already beading up on the stain! 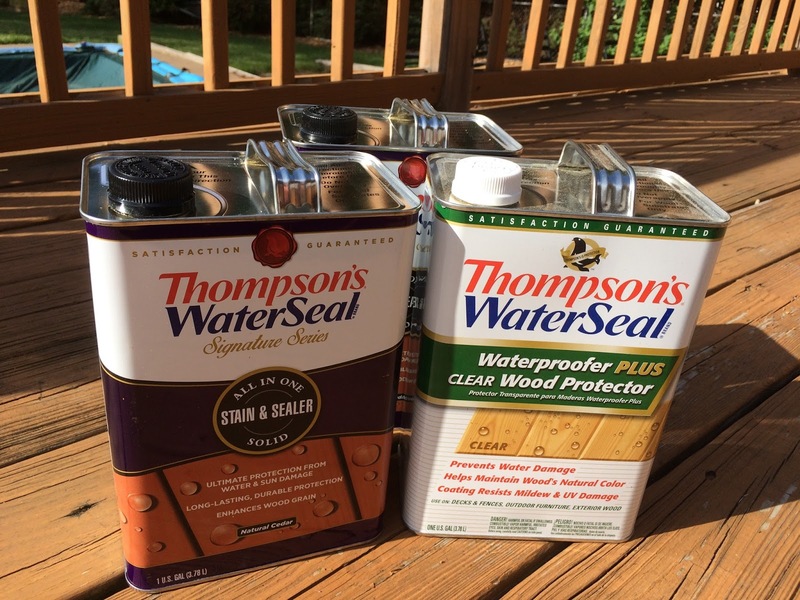 If you want more inspiration, visit Thompson's WaterSeal on Facebook, Twitter, and Pinterest for tips and projects! This is a lot of work, we used to have a deck and then finally we tore it down and got a patio and it is a lot easier to maintain. That is AMAZING you got it done in 6 hours, you are a workhorse! You must have done a great job, because the water is just beading up on it! It is a lot of work to maintain a wood deck, I would love to have a patio instead. Thanks for your kind comments! The stain works great and maybe it will last longer than the other brand! All of your blog posts have inspired me to take on a couple projects around the house that I never imagined I could do myself! Thank you Erin! Those are my "stain boots" HA! They used to be cute :-) You are too sweet! I know you can tackle any project! Be sure to tag me if you post about it so I can see!! Your wellies look so beautiful. Do they have holes? Yvonne, they are actually polka dots. Now I notice the dots. But the boots seem ripped at the toes? So glad you put this together! 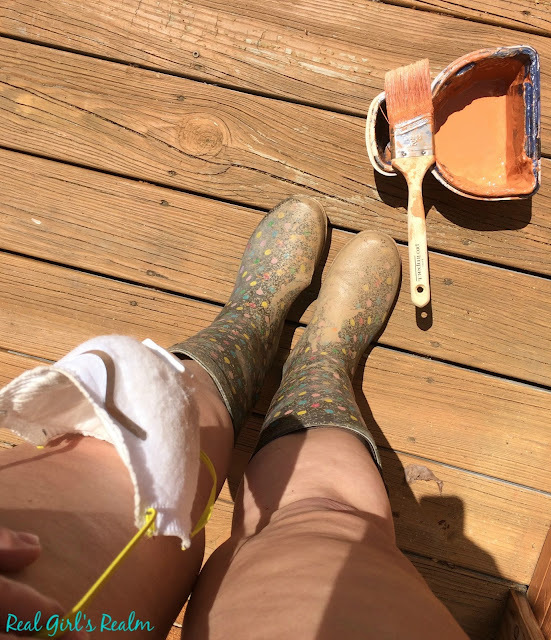 I have cleaning and staining our deck on my list of things to get done this month and I was a bit intimidated by it as I will be doing by myself. Glad to know that it is doable!